. Yellow Mountain Rose (yamabuki 山吹) . oodoiro, oodo iro 黄土色　"yellow earth color"
In ancient China it was a well-respected color, used for the tiles of the Emperor's palace and not allowed for the common folk. By the time of Prince Shotoku in Japan, there were two extremes, dark yellow 濃黄　and light yellow 薄黄　whith various shades inbetween. 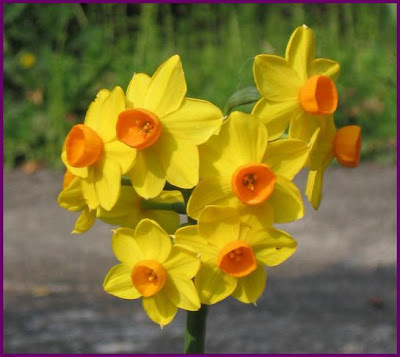 Around 650, it had become a color for the robes of the common people. Plants for dyeing yellow cloth were plenty and it was nothing special. kariyasu 刈安 (Miscanthus tinctorius #f5e56b) , kuchinashi 梔子 (gardenia #fbca4d 支子色), kihada 黄蘗　(Phellodendron amurense #fef263）plants. Kihada was also used to color paper for copying sutras or other texts. and so on, too many to list them all here. These words are synonymous with or represent various shades of the color yellow: banana, cadmium yellow, chartreuse, chiffon, cream, golden, goldenrod, khaki, lemon, mellow yellow, saffron, topaz, yellow ocher.
. yellow sand 黄砂 (こうさ) koosa .
. "yellow sparrow wind" 黄雀風 koojakufuu.
. yellow conch trumpet plant 黄つりふね ki tsurifune .
. yellow plum blossom 黄梅 oobai .
. yellow cockscomb 黄鶏頭 kikeitoo .
. yellow chrysanthemum 黄菊 kigiku .
. Spring flowers with 黄 yellow .
. yellow (leaves) falling, kooraku 黄落 (こうらく) .
."yellow fish" nishin 黄魚（にしん）herring .
. "yellow horse fish" 黄鯛魚 watako .
. yellowtail 鰤 buri .
. yellow sea bream 黄鯛 kidai .
. yellow gadfly 黄虻 kiabu, ki-abu .
. yellow bee 黄蜂 kibachi .
. yellow ant 黄蟻 kiari, ki-ari .
. yellow butterfly 黄蝶 kichoo .
. yellow (silkworm) cocoon 黄繭 kimayu .
. yellow sparrow, baby sparrow 黄雀 ki suzume .
. Narcissus flycatcher 黄鶲 kibitaki .
. Golden Week 黄金週間 oogon shuukan .
. yellow linen kimono 黄帷子 kibira .
. Yellow Fudo, Ki Fudo　黄不動明王 . ***** . Colors used in Haiku . Haiku by Issa with a "yellow voice"
calls to its parents in a yellow voice. Issa must have been in deep meditation and he heard the nightingale rejoicing and calling to its parents in a yellow voice. Issa is saying something about his silence. When you are in silence and a cuckoo from the bamboos starts singing, it deepens your silence. The Japanese expression is "yellow voice"
kiiroi koe 黄色い声 "a yellow voice"
"a child 子ども" with a high-piched voice. During the Edo period it was fashionable to compare the voice with a color, from white to the goshiki, five colors ５色の声. 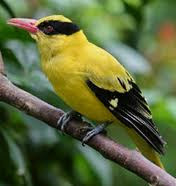 In ancient China yellow was already a symbol of alert.
. Voices of animals in haiku . (also spelled synæsthesia or synaesthesia, plural synesthesiae or synaesthesiae), from the ancient Greek σύν (syn), "together," and αἴσθησις (aisthēsis), "sensation," is a neurological condition in which stimulation of one sensory or cognitive pathway leads to automatic, involuntary experiences in a second sensory or cognitive pathway. According to Richard Cytowic, sound → color synesthesia is "something like fireworks": voice, music, and assorted environmental sounds such as clattering dishes or dog barks trigger color and firework shapes that arise, move around, and then fade when the sound ends. For some, the stimulus type is limited (e.g., music only, or even just a specific musical key); for others, a wide variety of sounds triggers synesthesia. Sound often changes the perceived hue, brightness, scintillation, and directional movement. Some individuals see music on a "screen" in front of their faces. Deni Simon, for whom music produces waving lines "like oscilloscope configurations—lines moving in color, often metallic with height, width and, most importantly, depth. My favorite music has lines that extend horizontally beyond the 'screen' area." Individuals rarely agree on what color a given sound is (composers Liszt and Rimsky-Korsakov famously disagreed on the colors of music keys); however, synesthetes show the same trends as non-synesthetes do. For example, both groups say that loud tones are brighter than soft tones, and that lower tones are darker than higher tones. Synaesthetes nevertheless choose more precise colours than non-synesthetes and are more consistent in their choice of colours given a set of sounds of varying pitch, timbre and composition. Fay’s Note: The poet plays with the letter “dan.” Usually, “ 断” (dan: forbid) is used for the word, but he uses “男” (dan: male) instead. With a character meaning “forbid,” the word “kindan-no-sono” is “a garden with the forbidden fruits”. Japanese school uniform is usually in deep-blue color. Is“yellow” he saw the color of ribbons on the female students? 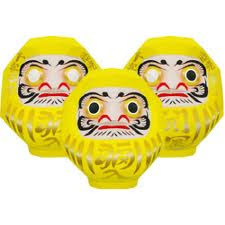 Or does he want us think about the young girls’ high-pitched voices , “kiiroi koe” (literally translation: yellow voice)? The first butterfly has come.